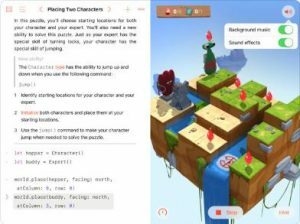 Swift Playgrounds is a revolutionary app for iPad that makes it fun to learn and experiment with code. You solve interactive puzzles in the guided “Learn to Code” lessons to master the basics of coding, while additional challenges let you explore code and create programs that are engaging and unique. Swift Playgrounds requires no coding knowledge, so it’s perfect for students just starting out, from twelve to one-hundred-and-twelve. The whole time you are learning Swift, a powerful programming language created by Apple and used by professionals to build many of today’s most popular apps. And because it’s built to take full advantage of iPad and the real iOS SDK, Swift Playgrounds is a first-of-its-kind learning experience.